August usually sees some extraordinary limited brews taken out some secret nook of breweries for the utter pleasure of sake lovers in pursuit of unusual nectars. Hamamatsu-Tenjingura Brewery in Hamamatsu has just put one out with another long name! 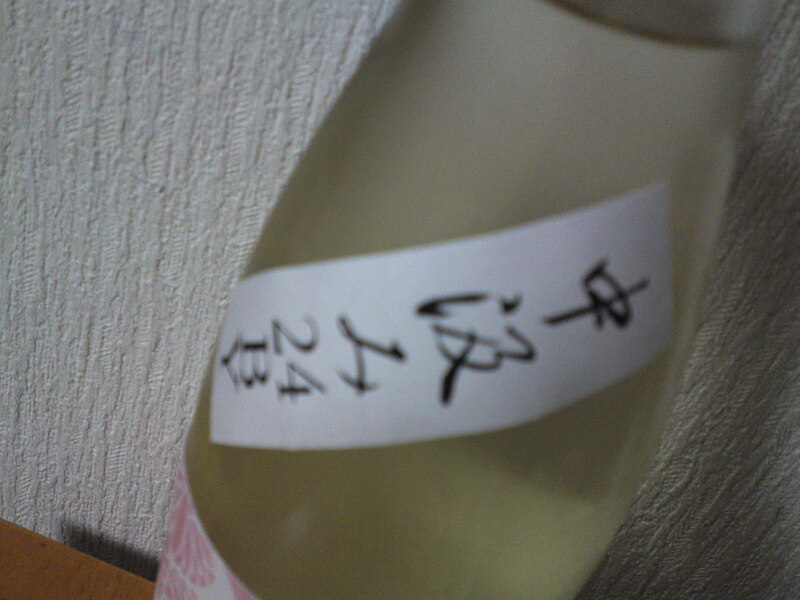 incidentally “nakakumi/中汲み” means that only the middle part of the pressed sake was considered whereas 24BY means Year 2013. 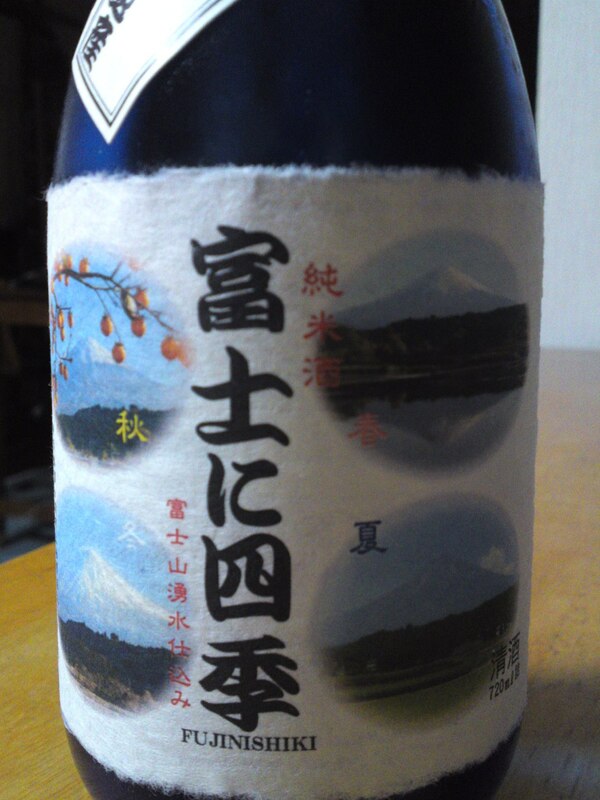 This a very local sake as the rice is Homare Fuji, a shizuoka-grown variety and the yeast also a Shizuoka-developed yeast. 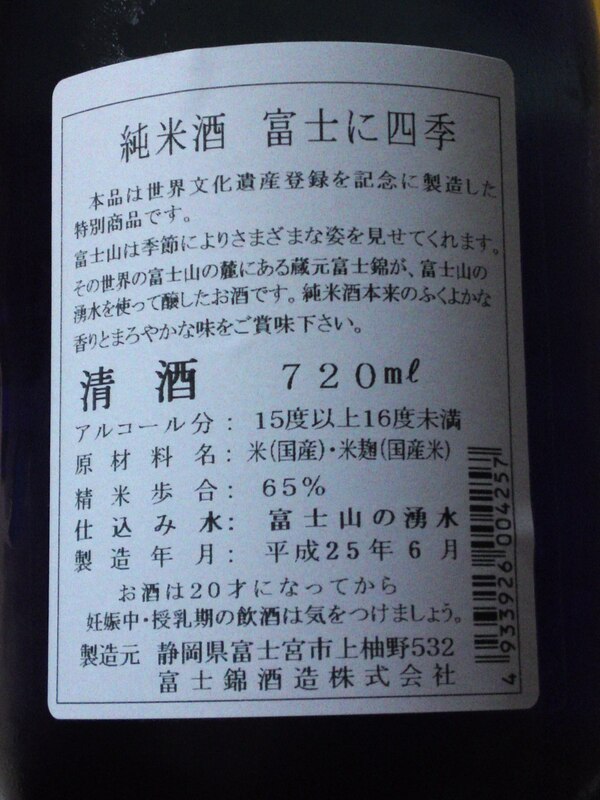 Muroka means it was unfiltered, Nama that is was unpasteurized and Genshu that no pure water was added to lower the alcohol contents. Taste: Very rich and fruity attack with puissant alcohol. Extraordinarily assertive pears reminding La France variety grown in Japan! Lingers only for a while ending on a rich dry fruity note with the same fruits accompanied by dry almonds. Complex as it almost wildly starts on a fruity sweetish note to rapidly escape on a very dry deep note revealing more fruits. 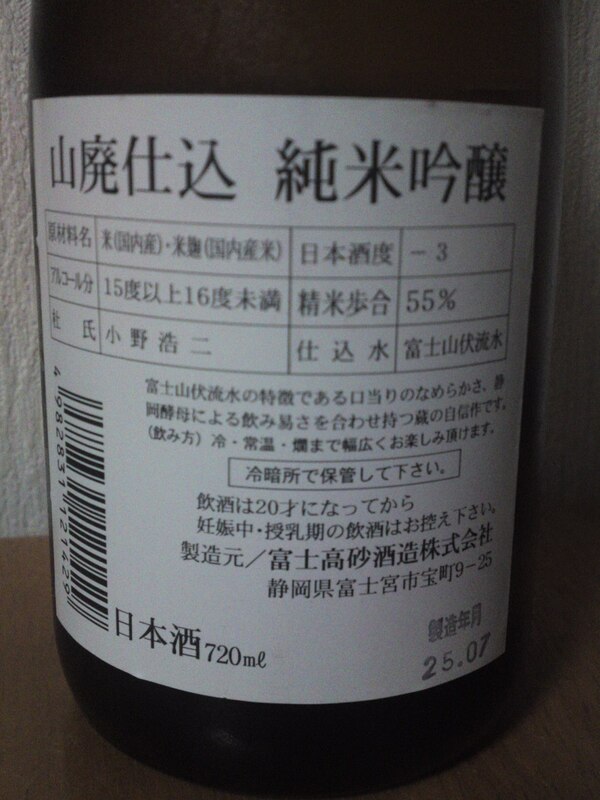 Overall: Little need to drink such a sake with food! Makes for the perfect aperitif and even digestif. Shows its qualities best when chilled. Splendidly marries with cheese if you must absolutely enjoy it with food! Fuji-Takasago Brewery is located in Fujinomiya City and as I said since Mount Fuji has been accepted by the UNESCO as a World Cultural Heritage, the brewery felt obliged to advertise the evenet! 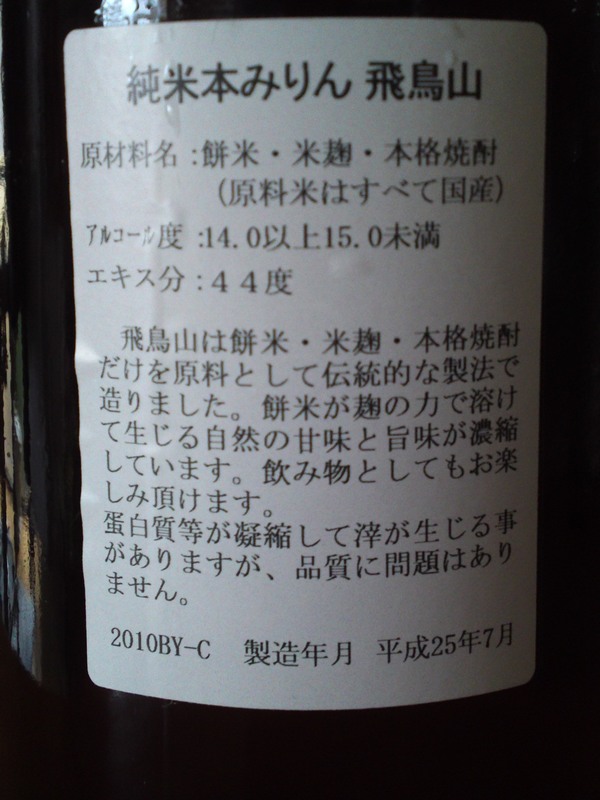 Taste: Well-rounded fruity and sweetish attack with assertive junmai petillant. Complex. Pears, almonds, hints of chocolate. Later, hints of sweet milk coffee. Tends to sweeten up with second long sip. 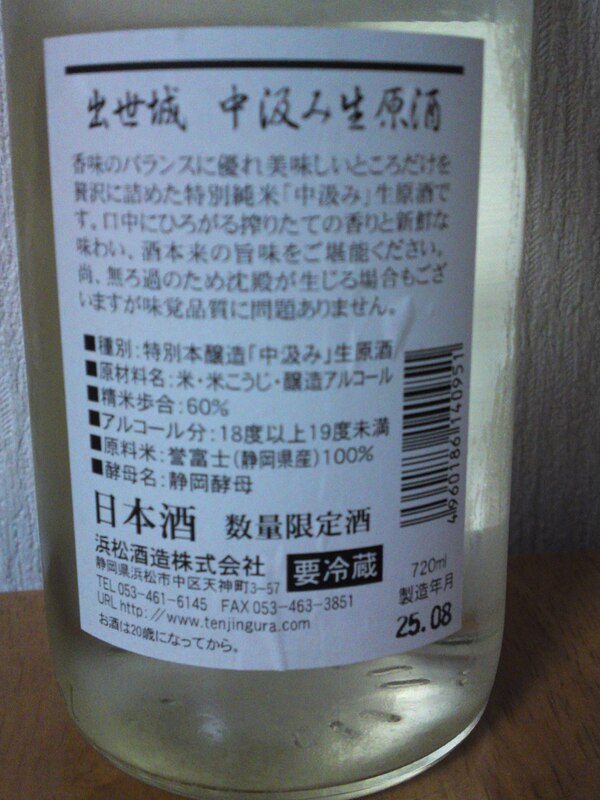 Surprisingly sweetish and pleasant sake for a yamahai. 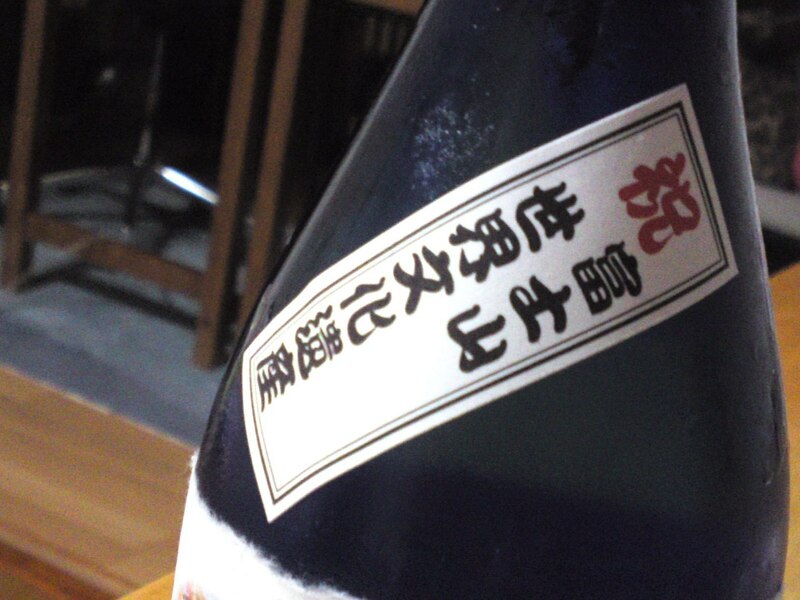 overall: A sake obviously designed to be enjoyed with heavy izakaya food, although thoroughly enjoyable on its own chilled. Probably best enjoyed by ladies thanks to its sweetish approach. 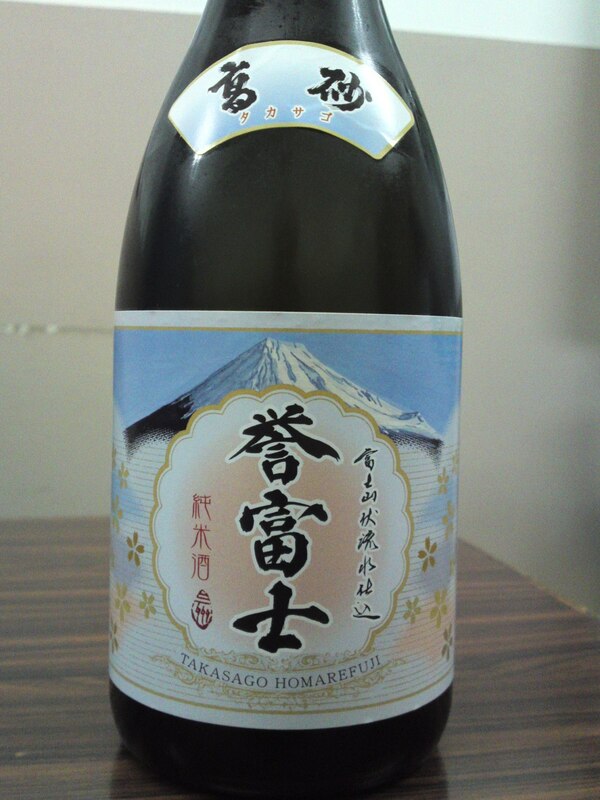 As I said before, with the advent of Mount Fuji and Matsubara Beach being chosen as the New UNESCO World Culture Heritage, the sake breweries have been scrambling to put on sale brews commemorating the event! Fujinishiki Brewery located in Fujinomiya City at the foot of Mount Fuji, came up with a beautiful label representing Mount Fuji in different seasons! 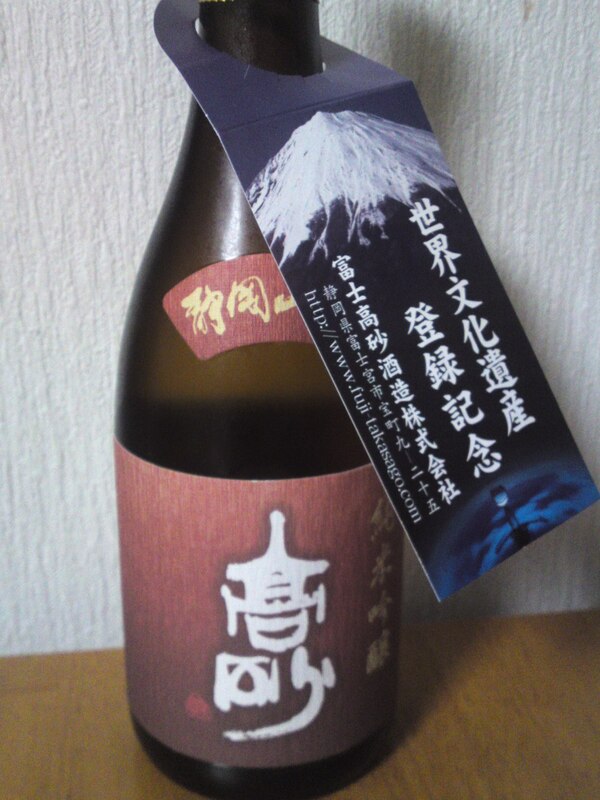 The small label on the bottle neck states the recent registration and election of Mount Fuji and Matsubara Beach as a new UNESCO World Cultural Heritage! Aroma: Fruity. Coffee beans, nuts, loquats. 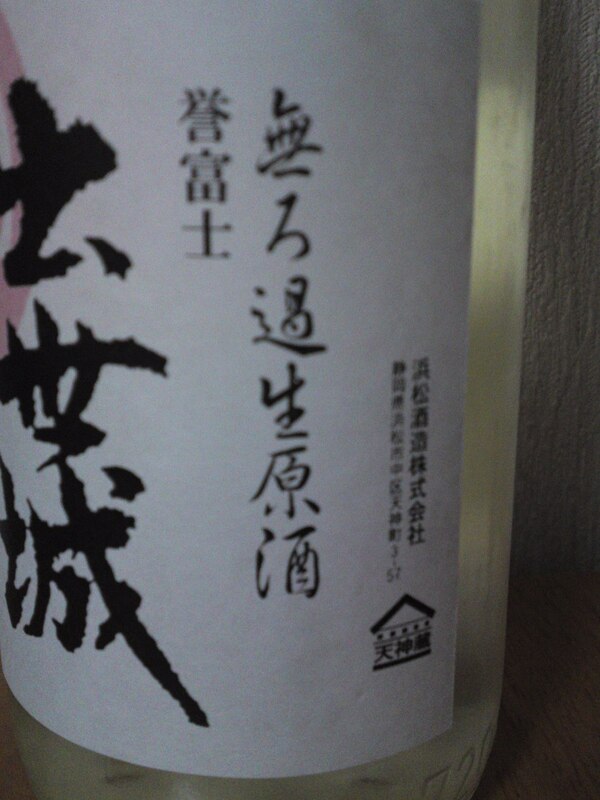 Taste: Sweetish attack backed up with assertive junmai petillant. Nuts, chestnuts, loquats, apricots, notes of coffee beans. Linger for a while before disappearing on a drier note. Tends to mellow with food. Marries beautifully with food, although it tends to take a back step. 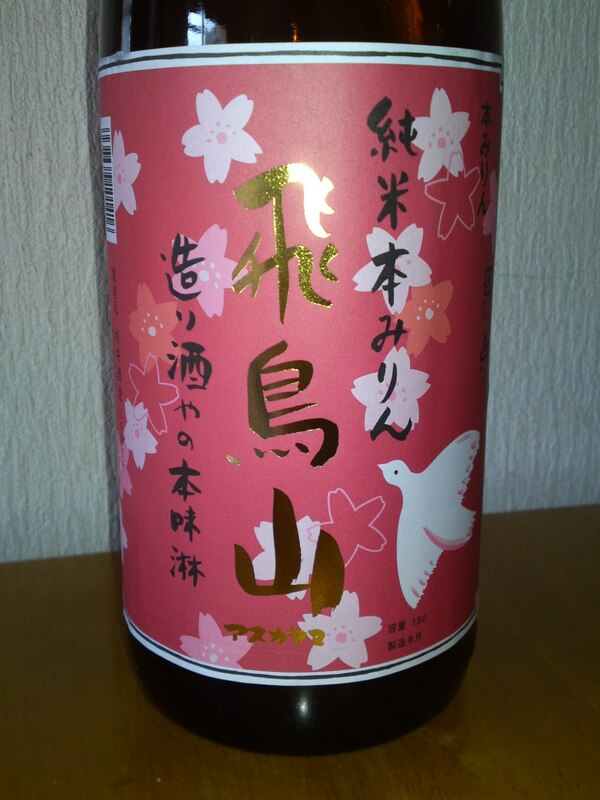 Overall: A typical sake from Fujinishiki Brewery conceived to marry beautifully with food, especially izakaya food, although it tends to make itself discreet then. Eminently drinkable on its own at all temperatures. Take it to great BBQ outdoors or as a present! Fuji-Takasago Brewery being located on the slopes of Mount Fuji had just to join in with a beautiful retro-style label! Aroma: Assertive and fruity. Pears with notes of banana. Alcohol. 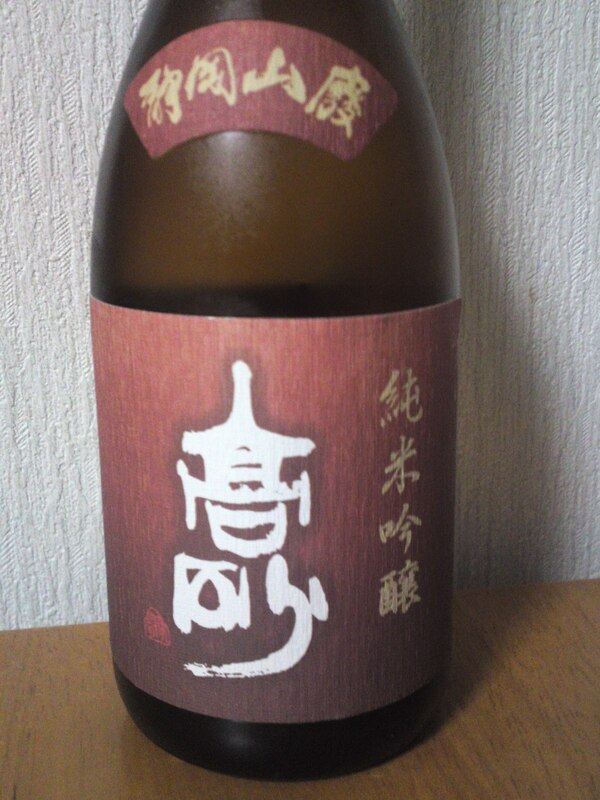 Taste: Well-rounded fruity attack backed up with some palate-warming junmai petillant. Disappears quickly on a strong nutty note. Mellows with food for a great marriage. 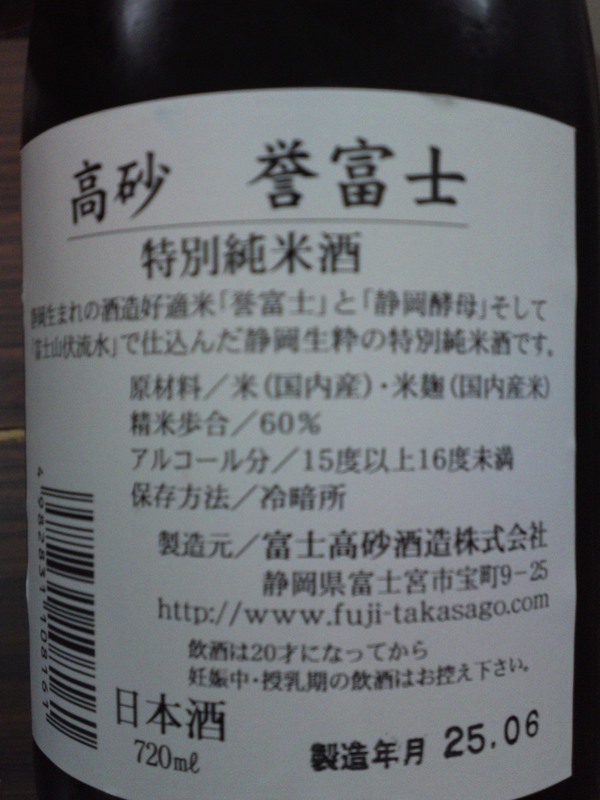 Overall: A typical sake from Fuji-Takasago Brewery. Shizuoka Prefecture-grown Homare Fuji sake rice seems to come into many intriguing guises demonstrating that the same rice with basically the same water and yeasts can give birth to a great variety of bectars!